We can provide all kind of tubular exchangers include fixed type, floating type & U-tube type, High/Low pressure feed water Heat Exchanger and other type exchangers. From the design, fabrication to site erection, all are included in our service scope. Materials can be ferrous and non ferrous to meet different operating purpose. Our products fully meet ASME Code and TEMA requirements, and can be applied for ASME stamp per the requirement of customer. We are authorized vendor of Lummus Technology Heat Exchanger, sell and manufacture the HELIXCHANGER and HELIFIN heat exchangers. The max. diameter for shop fabrication is around 4.8 meter. The max. thickness of tube sheet is 335mm. The max. diameter of heat transfer tube is 76.2mm. The materials of our products include carbon steel, stainless steel, copper alloy, duplex stainless steel, nickel alloy, titanium alloy and zirconium alloy etc. Can be designed and fabricated fully in accordance with customer's special requirements. Design service is available if necessary. There are a lot of materials can be chosen to meet customer's specific purposes. With a lot of experience, we can control the product quality and delivery schedule accurately to meet customer's special requirements. 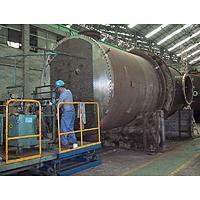 Pressure Vessels, Towers, Drums, Heat Exchangers, Reactors, Heaters, Cold Box, Power Boiler, Water Cooled /Gas Cooled Condenser.